Last night Sean and I made chana masala. We had it for the first time a few weeks ago at a local restaurant. We loved it so much that we decided to try and make it on our own at some point. Well, last night I had planned on making some soup from Vegan with a Vengeance but the weather was so bad that we didn’t want to venture out for groceries. 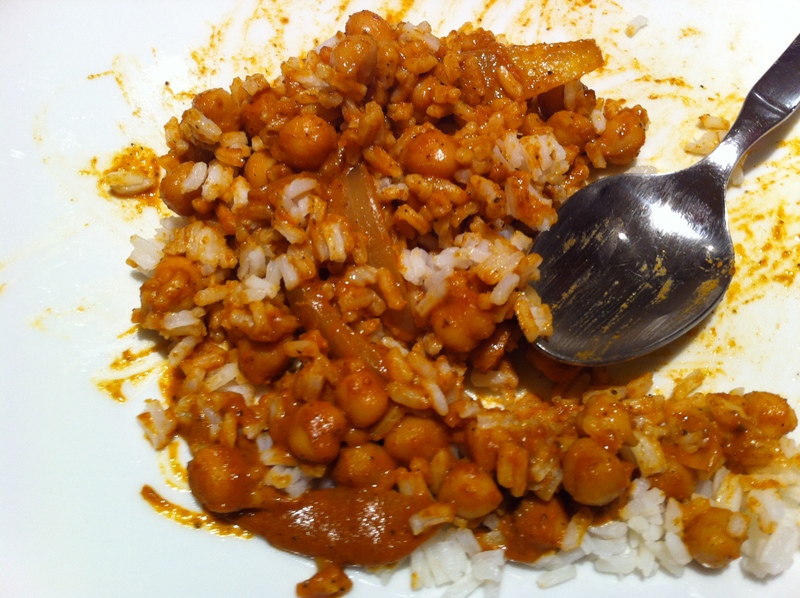 I checked my cupboards to see what I had for ingredients and realized that I had enough to make some chana masala! It was a bit tricky because while Sean and I like it super spicy, my 15 year old brother (who does love spice) can’t really handle super spicy food so we had to tame it down a bit. Saute the onion in the oil on medium heat until just about golden brown. Add the garlic and then the potatoes. Stir together. Add 1/4 cup of water, the curry powder, and the cumin to the pan. Stir all the ingredients together and cook until the water boils off. Then add the coconut milk, tomato paste, chickpeas, and salt. Cover and cook until the potatoes are cooked. Add more water if needed. Add the garam masala prior to serving. Serve over rice. We made instant rice to go with this dish. Normally we make jasmine but we had run out when we last made curry. This dish was really flavourful and great! When I added the tomato paste I accidentally added too much which made it taste off, but I read how to fix this. Apparently adding baking soda (an alkaline) neutralizes the acidity in tomatoes to get rid of the extremely tangy taste. I added about 1/8 tsp but this actually fixed it. I have another meal that we ate on Sunday that I plan on posting. Sean and I didn’t cook it, his dad’s fiancee actually did but it was just such a great recipe that I don’t want to forget it. It’s a really delicious vegetarian chili and it was phenomenal since it had sweet potato, which made for quite an interesting (and tasty) addition! I’ve done this recipe before and it turned out so delicious! I recommend that everyone try this!